Usha Ashok Haria | Oshwal Association of the U.K. Profile I was born in Meru, Kenya but my parents decided to move to Nakuru when I was 2 and a half years of age as there was no schools. Having completed my GCSE’s and a secretarial course I came to visit my sister in UK. I soon found a job and decided to settle permanently in the UK. Soon after, I got engaged and married to Ashok and moved to Northampton where I have lived since 1975. I love travelling, voluntary work, walking, meeting people. 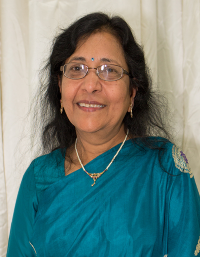 Vision for Oshwal I have worked on the Oshwal Committee from a very young age in Kenya and was fortunate enough to be elected on the Northants Committee and have served the Association with great passion and pride since 1992. Oshwals generally have done very well wherever in the world they have settled. There is so much talent within our young generation and we have seen this from various events held at Oshwal Centre e.g. Careers Fair, Annual Sports Events etc. In my opinion the future of Oshwals looks bright.